An illustrator by training and a deeply unrepentant word-nerd, D.M.Cornish is old enough to have seen the very first Star Wars. From such delighted flights of fancy he has developed an almost habitual outlet for his passion of word conjuring through the invention of secondary worlds and in particular the vast and dangerous Half-Continent. A foruitous encounter with children’s publisher, Omnibus Books, gave him an opportunity to develop these ideas further. A thousand words at a time, this has lead to the writing and illustrating of the Monster-Blood Tattoo series – Foundling, Lamplighter and Factotum. 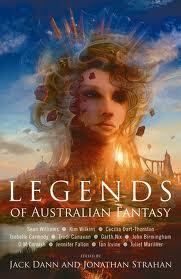 In 2010 you had a story included in the anthology Legends of Australian Fantasy, edited by Jonathan Strahan and Jack Dann. What was it like being included in an anthology with the likes of Sean Williams and Isobelle Carmody? And did you enjoy the opportunity to explore the Half-continent, initially created in your trilogy of novels focussed on the young character Rossamünd, from a different perspective? It was an honour to be asked to contribute and an honour to be included amongst such lights as Sean and Isobelle: though I have such a thick and purple way of writing I fear some readers who were the for Isobelle or Sean or Ian etc might have found my own story a bit “lumpy”. It was a delight to write from not just one but several different points of perspective about the Half-Continent, to tell a simpler tale with all adult characters not limited by their youth or social station. Your (first, hopefully!) trilogy, formerly Monster Blood Tattoo and now often known as The Foundling’s Tale, was also completed in 2010. What was it like to have all three books out into the wide world? What sort of reception has the trilogy as a whole received? It feels good, though kind of remote too: they have a life of their own where ever so often a reader contacts me with encouragement that lets me know the story is finding a good home somewhere. On your blog you have mentioned that you’re working on a new novel, which may or may not turn into a multi-volume series, that is definitely not about Rossamünd. Can you tell us who the focus is instead? Is it still set on the Half-continent? It is indeed still set in the Half-Continent and it focuses on a very very minor character from the third book of Monster-Blood Tattoo, Factotum, who becomes a protagonist unto himself and has adventures all of his own. I am finding that he is in some ways a successor to Rossamünd, that the themes of MBT are carrying on in this new fellow’s story, though he is older – in his twenties and has a sense of direction and control over his life that Rossamünd never felt in MBT. HINT: for those who have read Factotum, the character I am writing about now makes an appearance in MBT 3 based upon his ability to draw. Well, as lame as this is going to sound, I have not been doing a whole lot of reading for a little while now, but there is one beautiful gem that has got me fascinated, Anywhere But Earth, an anthology jammed with the luminaries of the Oz spec-fic scene. Also, I very much loved the animated version of Mr You-rock-sir Tan’s The Lost Thing. Two years on from Aussiecon 4, the World Convention held in Melbourne in 2010, what do you think are some of the biggest changes to the Australian Spec Fic scene? Now that I cannot answer – I sit in a room on my own making up stuff and rarely poke my head out to test the wind’s direction. So, shame on me, I can only offer a shrug.